Yes, A. Jaye, it all worked out in the long run, since I'm still writing for Marvel thirty years later! I hope Wally doesn't make a comeback, at least not in similar circumstances. I did use the name for a character in one of my very early CAPTAIN AMERICA stories, just for fun. I love that you thought Wally Lombego was such a popular writer that they put him in an issue of CAP. That's great, Chris! Someone told me years ago that the issue was published in England without the editorial changes. Now that I'd love to see. "Princess Leia traveling back in time to meet Martin Luther King and Gandhi"
Forward in time, surely. "A long time ago...". Guess you really aren't a fan. Proving my theory, Bob, that the internet isn't technology at all: it's magic! Maybe I should just go in and fix that mistake. I also read the Comic Book Legends often. Interesting take. The pages that Cronin scanned seem to work out fine, the editors did a good job of still making it work. I would have liked your version of the story better, as I think peace is the way, but I think the other version still kind of works. The thing that is a bit strange is that the Jedi are supposed to represent the keepers of peace. I don't think the Lucasfilm reps really understood their own material at the time. I guess I just have a different view of Star Wars than the Lucasfilm reps.
With respect to "A long time ago...", I don't think you are meant to think that it happened a long time ago. I think it is as if you're in the future reading an entry in the encyclopaedia. I think this idea came from Asimov's "Foundation" where each chapter starts with an entry from the Galactic Encyclopaedia. The entries aren't supposed to tell us that things happened in the past, they are supposed to tell people living at the time that it hadn't a long time ago. Wow, I remember that story, being a regular reader of the SW book. Even as a kid, I sort of noticed how okay with killing the characters in Star Wars and Star Trek were, and how it never seemed to even be worth mentioning. I mean, Luke single-handedly kills hundreds, if not thousands, of people at the rah-rah final scene of Star Wars. Props to you for trying this angle, even if they butchered it in the end. That's one awesome theory about the 'Net! Have you ever heard Quesada's musings that the iPhone is pretty close to Kirby's Mother Box? Zero interest in STAR WARS? Very interesting. 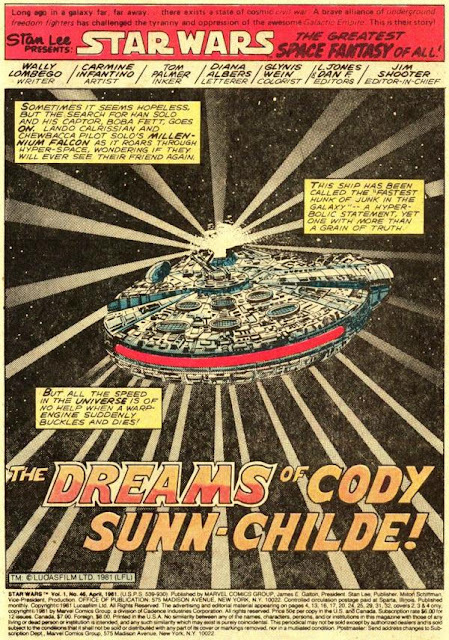 I just read this Star Wars comic for the first time about four or five months ago when I found a cheap copy of one of those Dark Horse trades that collect the Marvel run. A lot of that stuff was forgettable but this issue stood out to me when I read it. Didn't know that you wrote it. I remember when I read the ending of this story I was confused by it because even the art doesn't seem to complement the dialogue. I didn't understand why Lando was crying and I didn't know why he was talking about Sunn-Childe's revenge when the story seemed like it was about not having revenge! This comic makes more sense now. After I read this comic, I was like, "Who the heck is Wally Lombego? This story doesn't make sense! No wonder I never heard of this dude!" It was fun reading some insight of editorial life at Marvel Comics! Plus, I just put " The Life and Times of Savior 28" on my wish-list and it seems a very interesting book! Keep on the good work, J.M. It may not have ended up as the story you intended, but I read this issue dozens of times as a kid, and you know, your message still came through. At least for me. Star Trek, for all its space opera tropes, also featured stories that debated the merits of violence, spoke about the stupidity and futility of war, killing, etc. Even enemies were sometimes mourned when they died. Perhaps Star Wars has done that, too, but, not being an aficionado, I don't recall. In the end, I suspect the decisions about this story were made by someone in Lucas's licensing division. Given the talent and intelligence of the people behind SW (I may not be the biggest fan, but I have great respect for George Lucas and his team), I'd bet -- although I have no way of knowing -- that the higher ups wouldn't have objected to the story at all. Thanks for your interesting take on "A long time ago...", Quique. I assume this is one of those points debated by Star Wars fans. Anyone else out there have anything to say about this? Did Star Wars really take place in the past...is it somewhere in the future...or should we just assume it takes place in the realm of primal myth? I'm working on a story with a friend of mine, Jeff, that deals with the idea that the Net is alive...and purely magical. To me, it's as if the whole thing is being fed, on a daily basis, by our collective unconscious. And it just keeps growing and growing. I'm constantly amazed, and generally delighted, not just by our technological leaps but by the astonishing ease with which we adjust to them. I know I'm in the minority where SW is concerned, David. It's not that I hate it -- I've seen all the films -- just that it was nothing more than a pleasant entertainment to me. That said, I think it's great that it means so much to so many people and that it continues to ripple through our culture. If it makes people happy, then it's all right with me. The disconnect between art and copy on that final page is a bit jarring, Dru, isn't it? Thanks so much, Pino. When you get around to reading SAVIOR 28, let me know your thoughts. It's a piece of work I'm very proud of. Makes me VERY happy to hear that, John. Thanks so much for letting me know! I think Lucas has listed Foundation as an inspiration, since Foundation is one of my favorite books, I made the connection right away. Another book that clearly inspired a lot of Star Wars is Dune. Dune also starts every chapter with "historical" entries (sometimes poems). This is why I think the "long time ago" phrase makes more sense as being written in the future. Dune actually does seem to inspire a whole lot of Star Wars. The use of the VOICE in Dune, is almost identical to how Jedi can manipulate easy minds (a la Obi Wan in Mos Eisley "this are not the droids you're looking for"). Dune's main arena is Arrakis a desert planet, similarly a desert planet (Tatooine) is key in Star Wars. Jabba the Hutt looks like the description of Leto the God Emperor in the fourth book of Dune. Leia's name is very close to Alia's name. Leia and Alia besides sharing a name, share the fact that both are sisters of the hero of the story. Just writing all of that made me want to read Dune all over again. What a great book. I read DUNE when I was 18 or 19, Quique, and totally adored it. Immediately jumped into DUNE MESSIAH and loved that just as much. Read quite a few other Frank Herbert books as well, back in the day. My memory of the DUNE books is that the series started to falter after CHILDREN OF DUNE and I lost interest. I wonder how I'd feel re-reading those books today? The last one I read in the series is God Emperor of Dune (the fourth one). I even liked it more than the first one, but since I heard that the quality drops a lot in the following books, I never read the next two. One aspect of Herbert that made me enjoy his books very much is that whenever I would read about one of his characters, I really believed the characters were as smart as advertised. This is not something that Star Wars novels or even most superhero comics do well. For example, while I know that Peter Parker is a genius in theory, I don't think many of the writers actually make him seem like a genius. All this DUNE talk has me seriously thinking about going back and re-reading the first one, at least. Part of me is afraid to: if I don't like it, I'll destroy a beloved myth. matter what happens it won't take away the enjoyment it gave you when you first read it. Yeah, the tones of those franchises are radically different. The Enterprise's primary mission was exploration, while the Jedis are a militia/law enforcement order. I'm not a pacifist, but I love SAVIOR 28, and this sounds like it would have been a powerful story, too. S-28 and your Cap arc have been influential in my thought process. It's all about balance for me. Anyway, I feel like you do a great job of sticking to your core principles without losing sight of characterization. Your heroes are heroic, your villains sympathetic, and all of them deeply human. So this insight is just another example of how important it is to speak your mind, even if does occassionally lead to frustration. In fact, frustration is probably a good indication that something powerful is coming down the line from another realm. And it's way cool that you got to make the homage to your newborn son, even if it didn't turn out as intended. "Fear is the mindkiller" is the line I've never forgotten. Quique; so maybe I'll face my fear and give it another read! 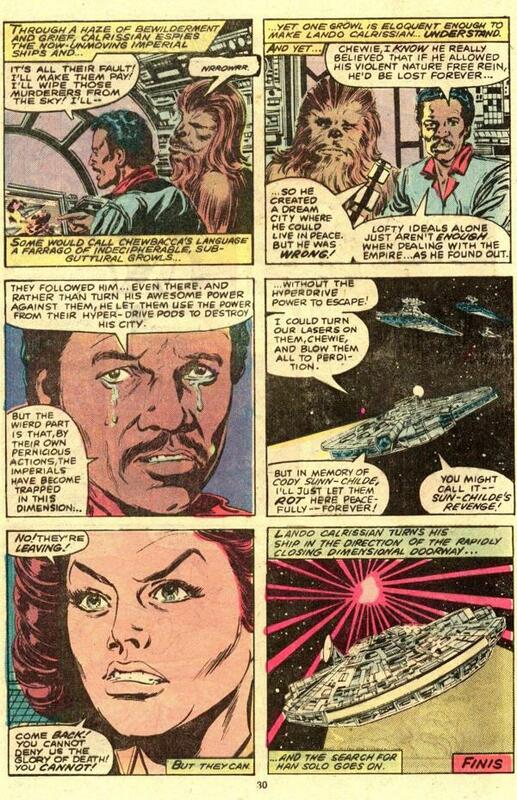 In the end, David, the whole Wally Lombego Incident was "long ago in a galaxy far, far away." It's just a fun story now, one that I've enjoyed sharing. And thanks, as ever, for your extremely kind words about my work. I have to say that S-28 and Imaginalis are works that I really like. It is surprising that they both come from the same writer that wrote something as dark (but also amazing) as Kraven't Last Hunt. I'll have to reread my Spidey issues to see if I find a glimmer of hope somewhere in those pages. LAST HUNT was written during a very dark period of my life, Quique; but there is definitely a thread of hope in there. Spider-Man's entire journey is a descent into darkness, followed by a rising into hope. And love. By the way, I've been reading your blog since it started and I must say that it's impressive that you take the time to respond to comments! Thanks! It's a genuine pleasure, Dru. You should absolutely re-read KRAVEN'S LAST HUNT, Quique. I think it's one of the most inspirational Spidey comics ever written. WOS 32 is possibly my favorite Spidey cover ever, and I think that iconic image of Spidey rising from his grave says it all. I remember the first time I read the finale of KLH. The scene where Vermin emerges from the sewers and it's daylight hit me like a ton of bricks. It's like that initial reaction you get when you open all the curtains on a sunny day and the light comes flooding in. That was definitely straight out of my life, David: I felt like Spidey, crawling up out of the grave, called on by Mary Jane's love; and like Vermin, climbing up out of the sewers into the light of day. I also felt very much like Kraven -- but my story had a much happier ending than his. I'm very glad for that! I felt like I was in a dark place, too, in the summer of 87. My parents divorced, we moved, and I was having trouble making friends. Spider-Man was my escape from all that, and KLH helped me to see that light on the other side through Peter's eyes. David, if my story helped you through a hard time, in any small way, I am PROFOUNDLY grateful. I read the story on CBR the other day and quickly went back for a reread of the issue. Whilst the changed ending didn't seem out of place when I first read it, your original ending sits so much better in your body of work. BTW got my copy of Imaginalis on Saturday. Started reading it yesterday (Sunday) and just finished it. Thank you so much. It's a wonderful story and made a 48 year old man (sitting reading the ending during his lunch hour in a food court) have to consciously stop himself from crying. Happy to hear from you, Brett. You hit it right on the head: if the publisher wants more IMAGINALIS, I'm ready to give it to them. (I'd really like to crack that world open and do something with more scope.) But it all comes down to sales. More important at the moment is the fact that the story touched you. THAT'S the reason I write, so thank you for sharing your reaction to the book. No interest in Star Wars? Shameless plug time; check out recent posts of mine at www.unseenfilms.blogspot.com in our "On Further Review" section (either click On Further Review or my name in the Labels section). While I like the movies, I go to some lengths to show they really aren't that good, so I can understand why you didn't quite see why all the fuss. Because of some things that came up this past weekend, Ken, it looks like I won't be attending NYCC this year. So I'll won't be able to sign your STAR WARS issue after all! I will absolutely check out the blog and see what you have to say about SW. As I think I've noted, it's not that I hate these movies, they're, for the most part, fun and enjoyable, old-fashioned space adventures. I just never connected to them in the way so many other people have. The mythos never settled into my psyche in any resonant way. Sorry I'll miss you at NYCC. Maybe next year...or another time in California. Too bad about NYCC, but yeah, I'll run into you sooner or later...and here! I'm disappointed about not going, too, Ken; but you're right about one thing: you can always find me here (although it's hard autographing comics in cyberspace!). By the way, Ken, I read the first of your STAR WARS re-reviews and enjoyed it. The one thing I really can't pick on, though, is the dialogue. Well, I CAN, but then I'd have to pick on half of the science fiction and fantasy stories in existence. Not to mention comic book characters who say things like "By the Hoary Hosts of Hoggoth!" Half the characters in comics talk like they're in a low-rent Shakespeare company and the fun in doing that kind of heightened dialogue is trying to make it both poetic...and somehow emotionally real. Look forward to reading the rest of the reviews. Oh, I agree whole-heartedly with you about comics and sci-fi dialogue in general...it is all rather silly & overblown, and that's kinda the point when you're fighting giant spiders, or having gods toss bolts of lightning around. While I do enjoy that stuff, I sometimes cringe at it; then I go watch a film like Grosse Pointe Blank where people talk like...people. I know what you mean, Ken. Early in my comics career, I think I overdosed on writing that kind of dialogue and it took me a while to find my ability to write natural dialogue. That said, when the balance of poetry and emotion is right, it can be great fun. But it always helps to have at least ONE character who talks like a normal human being! BTW, did I mention I enjoyed your post here about the fate of Wally Lombego? Excellent story, thanks for sharing. Also, for those who commented on Kraven's Last Hunt, the interview you did with Vincent Zurzolo for Comic Zone Radio on April 18, 2006 is downloadable from http://www.comiczoneradio.com/, and I remember you discussed your frame of mind and state of being when you wrote that story, and it really put the book into a new perspective for me. It made an already great piece of literature rise to a new level. Thanks for reading my posts, appreciate haviong you as an audience as well as someone I read. Great idea, Ken -- and I won't be surprised when we're able to do just that. With technology these days it seems like we imagine it...and it manifests. Glad you enjoyed the Tale of Wally. There was another pseudonym I used back in the day: Michael Ellis. But that's another story for another time. I wrote the whole story of how Kraven's Last Hunt came about in an essay for the most recent reprint of KLH. I also posted a version of it on my old Amazon blog, a few years back. I'll be happy to re-post it here, if folks are interested. I have the first HC collection of KLH (thanks for signing it over the monitor...er, in Anaheim in April...), and don't remember reading it on the Amazon blog; I, for one, would love to read the whole story! Interesting review, Ken. I tend to think that a movie can be "good" for different reasons. The main thing, for me at least, is whether a movie makes that emotional connection--which the original SW trilogy clearly does, in spite of its flaws. One thing that Lucas really brought to the table was the "big picture." John Williams' score, for instance, sells a lot of emotional moments that might otherwise have fallen flat. The merchandising angle makes kids feel like they're not just consumers, but Agents in the Story. I'm under no illusions that Lucas' goals were quite that lofty, but that's how I felt about it as a kid. BTW, I've heard the argument made that Lucas was inspired by Jack Kirby's FOURTH WORLD. A scarred villain whose son is working for his greatest enemies, and whose name happens to be "Darkseid" (Dark Side, anyone)? David, I agree with you, especially on the music (part of why I didn't mention it in the review...it's actually fantastic, you can't rip it apart). Seems to me, David, that Lucas was inspired by many things: Joseph Campbell, Akira Kurosawa (specifically his film THE HIDDEN FORTRESS), comic books (it's not just the Fourth World, there's a lot of Doctor Doom in the scarred and helmeted Darth Vader). What GL and his collaborators did was what J.K. Rowling did so well with HARRY POTTER, what all writers do (if they're lucky and talented): synthesize their influences, add their own unique POV and come up with something fresh: We can argue the merits of the SW movies all we want, but I don't think anyone can argue (well, I'm sure SOMEONE can, but not me) with the fact that Lucas added new flavor to a tasty stew of old influences, inspiring a whole new generation in the process. I don't have to love the movies to appreciate the power of that achievement. David and Ken, you're both right about the power of music to transform a film. One of the classic examples is the first, incredibly flawed STAR TREK movie; specifically the scene where Kirk and Scotty stare in awe (and stare in awe and stare in awe) at the Enterprise. It's a long, dull scene that could have been done in a quarter of the screen time, but Jerry Goldsmith's music not only makes it bearable, it actually adds some majesty to the moment. R2-D2 and C-3PO were clearly inspired by two of the characters in The Hidden Fortress. I had read that Star Wars was heavily inspired by The Hidden Fortress, but when I watched The Hidden Fortress I saw few similarities. I noticed the two funny characters and the part about saving a princess (kind of like Luke and Han saving Leia) but I was expecting it to be a bigger rip off. I posted on your ROTJ review. Hilarious! Great site, by the way. I'll admit I'm more of a mainstream film kind of guy, so I don't know most of those films. Any other mainstream films reviewed? The most obscure movie I can think of I've ever watched was a made-for-HBO Patrick Stewart movie called SAFEHOUSE. I know it probably doesn't qualify as that obscure, but as far as my tastes go, it is. And it was a great film, incidentally. I had the same experience when I saw HIDDEN FORTRESS, Quique: I expected to see even more similarities. That said, those are still two major elements. But, again, Lucas transformed them into something uniquely his. I've watched ST: TMP a number of times, David; and each time there's a part of me that hopes it will be better than I remembered. I still think that a sharp editor could cut it down to ninety minutes and make it a solid, entertaining film. There are some great moments, but they're surrounded by some pretty dull stuff. Nicholas Meyer? I love the guy: HUGELY talented. If you haven't read his autobiography, which came out last year, you should. It's delightful. I'll look into it. Is that MY LIFE FROM THE BRIDGE? Close: it's called THE VIEW FROM THE BRIDGE: MEMORIES OF STAR TREK AND A LIFE IN HOLLYWOOD. Ah, got it. I'll check it out. I recall Glenn talking about meeting Meyer and getting the book autographed in one of his blogs. I have unceasing admiration for the man behind WRATH OF KHAN and UNDISCOVERED COUNTRY. Kudos to whoever pegged him to revive and later send the original franchise off. It's a shame Meyer hasn't directed more films: now there's a guy who'd know what to do with MOONSHADOW. If I'd used Forbush, Stan Lee would have sued me! I always considered "A Long Time Ago" as the equivalent of "Once Upon a time." Not really meant to be taken literally as the past but simply another time and place. Sort of a fantasy thing.